The Fitzroy is a three bedroom country cottage style kit home by PAAL kit homes. It is designed to fit a narrow block being just nine metres wide. The main bedroom precinct is at the front of the house and has a walk through robe to an ensuite. The other two bedrooms are close by and near the full sized bathroom containing the toilet. There is a good sized open plan kitchen, dining and lounge area at the other end of the plan with easy access to the laundry, and potential alfresco options. 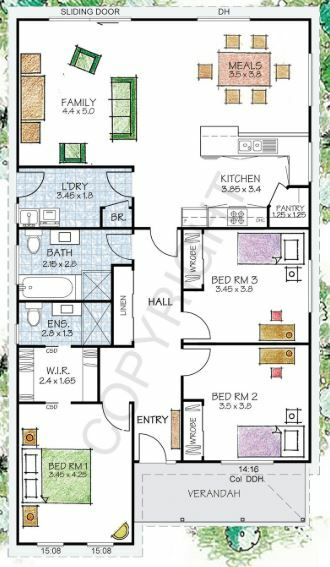 The plan is 154sqm under roof and the full kit is priced at $103,950. Their 'full kit' is way above normal and totally worth the money: especially for the owner builder. It includes a 2.7m ceilings, tools, cladding allowance for brick, ceiling insulation, owner builder course and white card. You also get undercoat paint, tile allowance, waterproofing kit, plumbing kit and electrical kit, a kitchen and PC (prime cost) items. The PAAL site is here. More kit plan reviews can be found here. Or return to kithomebasics home page.